She was touted as the safest ship ever built, so safe that she carried only 20 lifeboats - enough to provide accommodation for only half her 2,200 passengers and crew. This discrepancy rested on the belief that since the ship's construction made her "unsinkable," her lifeboats were necessary only to rescue survivors of other sinking ships. Additionally, lifeboats took up valuable deck space. At 11:40 PM on April 14, 1912, she struck an iceberg about 400 miles off Newfoundland, Canada. Although her crew had been warned about icebergs several times that evening by other ships navigating through that region, she was traveling at near top speed of about 20.5 knots when one grazed her side. Her fireman compared the sound of the impact to "the tearing of calico, nothing more." However, the collision was fatal and the icy water soon poured through the ship. Two hours and forty minutes later, the Titanic plunged to the bottom of the sea, taking more than 1500 people with her. 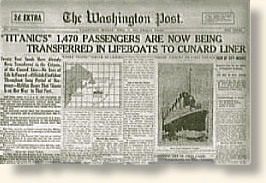 The sinking resulted in the deaths of 1,517 of the 2,223 people on board, making it one of the deadliest peacetime maritime disasters in history. The world was stunned to learn of the fate of the unsinkable Titanic. It carried some of the richest, most powerful industrialists of her day. Together, their personal fortunes were worth $600 million in 1912! In addition to wealthy and the middle class passengers, she carried poor emigrants from Europe and the Middle East seeking economic and social freedom in the New World. The Titanic sank 1000 miles due east of Boston, Massachusetts, and 375 miles southeast of St. John's, Newfoundland. She sits at a depth of 2.5 miles (12,467 feet) on the ocean floor. The idea of finding the wreck of Titanic, and even raising the ship from the ocean floor, had been around since shortly after the ship sank. No attempts were successful until the remains of the Titanic were found in 1985 by Dr. Robert Ballard, of the Woods Hole Oceanographic Institution and Jean-Luis Michel of the French Oceanographic Institute. When they located the Titanic, they saw that, as some survivors reported, the ship had broken apart. Ballard believed the weight of the water-filled bow raised the stern out of the water and snapped the ship in two just before it sank. Debris falling out of the ship was strewn over a 1/2 mile across the sea floor. The bow and the stern were found nearly 2000 feet apart. The discovery of the Titanic would not be possible without very specialized equipment. The teams that found the Titanic used deep sonar to locater her. 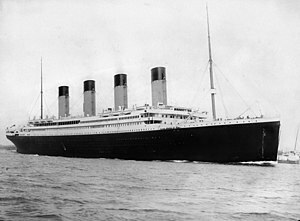 The use of manned submersibles and remotely operated vehicles (ROV's) made it possible to truly rediscover the Titanic. Video cameras aboard the unmanned submersible Argo/Jason were the first to document the Titanic's visual state on the bottom of the ocean. In 1986, Ballard returned to the wreck site aboard the Atlantis II to conduct the first manned dives to the wreck in the submersible Alvin. Now it's time for you to learn more about these amazing submersible vehicles and just what they can do. Click on the link below to observe footage of the wreck Titanic which was filmed by the submersible. Using the link below, explain what the terms DSV and ROV mean and tell the differences between the two submersibles. Using the links below fill in the chart about the following submersible vehicles that were involved in the discovery of the Titanic. 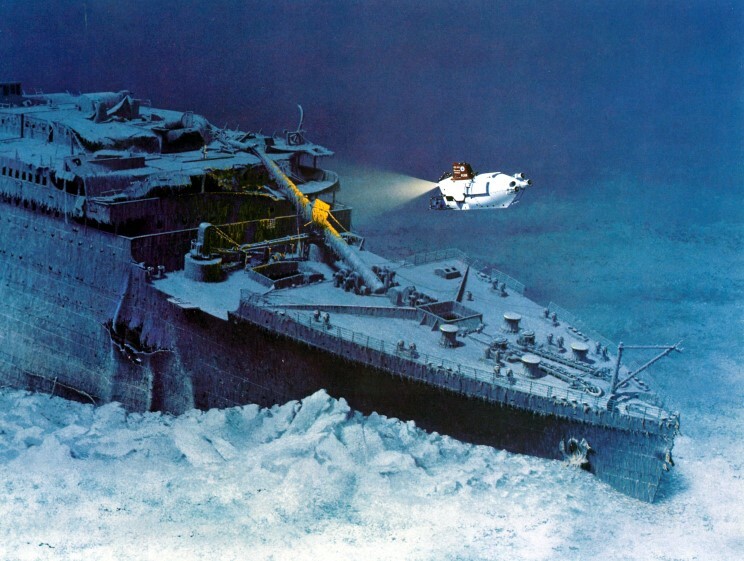 The Titanic is just one of the amazing discoveries of the ocean that submersible vehicles have made possible. Hopefully this lesson has piqued your curiosity about studying submersibles and the many other mysteries of the deep.